Keeping the Pounds Off! : Three seats in the Toilet? Three seats in the Toilet? Lots going on. Just a quick post so you know I am alive. Last week my husband and I ate at Bistro on Park, a restaurant in Winter Park, Florida. I had an adequate salad. They called it a Cobb salad. It had the ingredients of a Cobb salad but that is where any semblance to Cobb salad ended. Note to the chef: a Cobb salad has all elements diced to a uniform size. It is not a Cobb salad when the egg is sliced, the chicken is stripped, the cheese is crumbled, the cucumbers are rounds and the tomatoes are wedges. My husband had a portobello mushroom cap served as a burger and he pronounced it excellent. 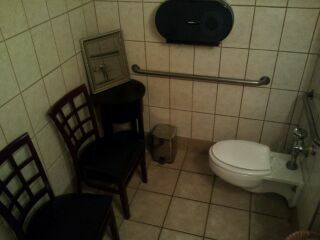 Why are there chairs (yes, plural) in the single toilet restroom? Does the line ever get so long that people line up on seats in the toilet, waiting their turn? Does anyone really need or want a mirror pointing at them while they sit on the toilet? The same style chairs are in the dining room. Who sanitizes these chairs before they are placed back in the dining room? It is a fact that we eat larger portions when we dine out. Visit a restaurant's bathroom before you order your food or have your meal. It could help you eat less or even prompt you to leave and eat at home. This made me laugh and cringe all at once. Though I have to say, the "mirror" thing was the most cringe worthy for me. Yes, even over the thought of the chairs going back to the dinning room when needed. Are the chairs there as a baby changing area maybe? Seems weird!